Peacehaven is a town in the Lewes district of East Sussex. It is located above the chalk cliffs of the South Downs approximately six miles east of Brighton. Its site coincides with the point where the Greenwich meridian crosses the English south coast. To the best of my knowledge it never had a railway but the name appealed to me as I always imagine my modelling activities will take place in a peaceful way! 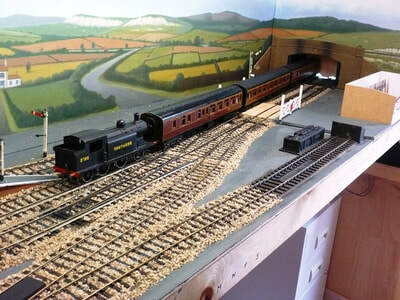 After a break of about 55 years, I have found time to resume the railway modelling I had started in my youth. 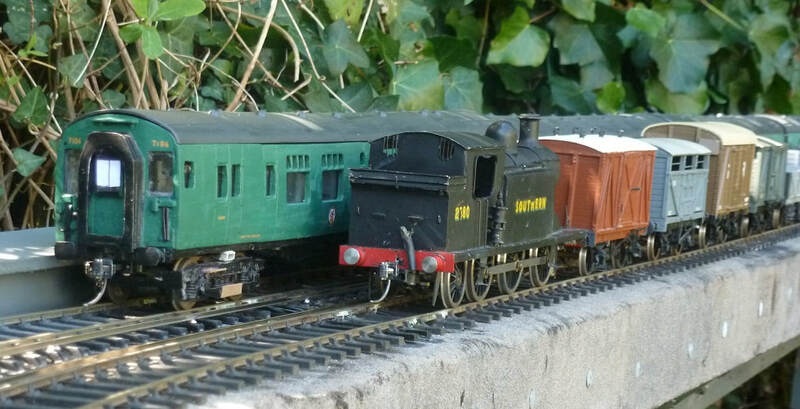 Modelling in Gauge O always appealed to me and now I have the chance to put it into practice. 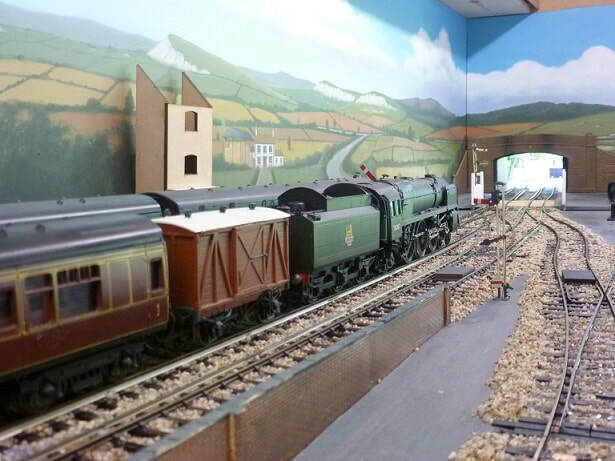 In my imagination, a fictitious 4-mile branch line runs to Peacehaven, leaving the Lewes to Seaford main line at a junction at Southease and Rodmell. The construction of the model is at an early stage and will hopefully develop over the years. 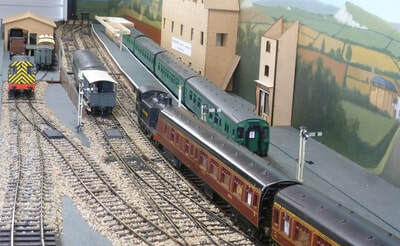 Thus far the terminus at Peacehaven (located in the garage) is at the end of the single line branch. 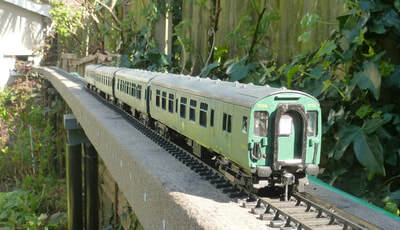 The line runs down the garden on an elevated trackbed, to an intermediate station at Telscombe. For the moment this is a dead end station although phase 2 (in the far off distant future) may see the line extended up the other side of the garden to the junction with the main line at Rodmell. The garage section of the railway is built on fold-up boards which, when stowed, take up minimal space. There is an added advantage in that when in the folded position, all the under-board electrical installation and wiring can be carried out without having to work upside down! The garden section is constructed on 2-inch boarding mounted on posts comprising pairs of reinforcing bars driven about 3 feet into the ground, surmounted with a concrete pad and plastic drain pipes, filled with concrete. These provide a fairly stable structure. Track standard is fine scale, the indoor section using Markway track and points, outdoors using C&L track obtained second-hand, and Peco points. Dummy conductor rails are gradually being installed, these being code 100 FB rail, mounted upside down. The minimum curve radius throughout is 6-feet and the electrical control is analogue with section switches which can be fed from one of two controllers at Peacehaven and a separate controller at Telscombe. 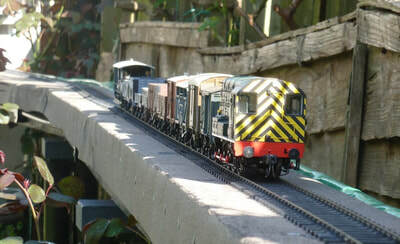 Rolling stock is mainly second hand, some from GOG E&T and some from other sources. The era modelled reflects my early interest in BR (Southern Region), although the period is fairly flexible. A 4-CEP EMU has been made by cutting up and re-assembling cheap second-hand Lima Mk I coaches. Having acquired several other Lima Mk I coaches in lined maroon livery, too good to alter, I operate a Saturdays only holiday train from Birkenhead to the South Coast, the loco taking over the Peacehaven portion (usually 4 coaches) at Redhill! After some indecision, I finally decided to use Kaydee couplings. These work superbly and look fine on the coaches and EMU but less good on freight stock. 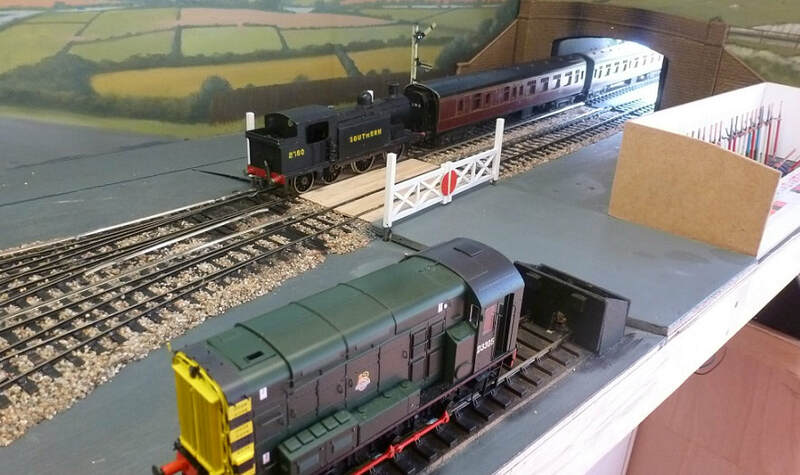 However my main interest is railway operation and so shunting in the small yard is a must, and running round both the passenger and freight trains can be hands-free. 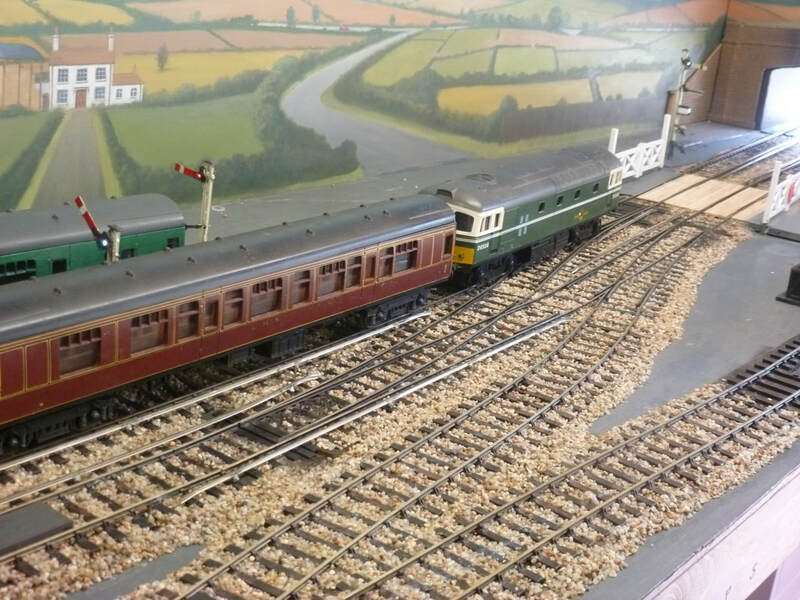 Signalling (along with everything else on the railway) is still being developed but is operational and signals are electrically interlocked with points and the level crossing. As the railway develops, further photographs will be added to this web site.